Goji berries are vibrant red berries that boast a deliciously intense flavour, are loaded with valuable nutrients, and make a tempting snack between meals. Certified Organic and Raw Goji Berries. Click here to get your 100g Bag of Free Goji Berries! Goji berries (also known as Wolfberries or “Red Diamonds”) are the vibrant red berries that grow on the Lycium barbarum plant. 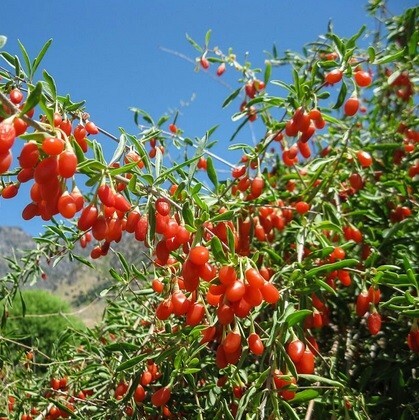 The Lycium barbarum plant (a species of the Box Thorn plant) is native to the cultivated valleys of Mongolia, where these certified organic Goji berries have been sourced from, and have been enjoyed by local monks since 800AD. These goji berries are never handled whilst harvesting – instead they are gently shaken onto mats and dried in the shade to prevent them from oxidising. Although small in size, goji berries are full of valuable nutrients, including vitamins B1, B2, B6, C, and E, the minerals zinc, iron, copper, calcium, germanium, selenium and phosphorus, carotenoids, polysaccharides and beta-sisterol. Goji Berries contain a variety of vitamins, including B1, B2, B6, and E.
Contain a wealth of minerals, such as zinc, iron, copper, calcium, germanium, selenium and phosphorus. 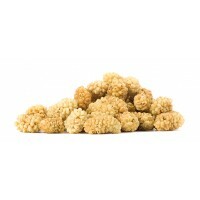 Are certified organic by "Organic Farmers & Growers", the UK’s leading government accredited organic certification body. 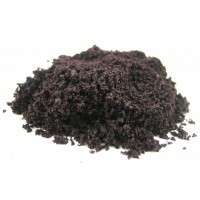 Are dried and processed at a low temperature for the optimum retention of their naturally occurring nutrients. Are completely pure and contain no artificial additives. 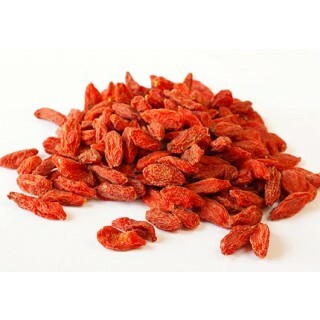 Goji Berries are are ideal in your favourite smoothies, shakes, juices and protein drinks. Pre-soaked goji berries are a delicious addition to rawfood recipes and a colourful topping on salads, breakfast cereals and desserts. Are suitable for vegetarians, vegans and raw foods enthusiasts. The benefits of goji berries are not merely confined to their impressive nutritional make-up, these small red berries have far more to offer than just a welcome boost of vitamins and minerals. That’s because goji berries are an incredibly versatile little fruit that’s also huge on flavour. Goji berries boast a highly distinctive flavour that’s often likened to an irresistible blend of cranberry and cherry, and make a deliciously sensible snack between meals, either just as they are or added to your choice of trail mix. Alternatively, goji berries can be blended into smoothies, or pre-soaked in water for use as an additional ingredient in your favourite raw chocolate bars and snacks. Goji berries also make a wonderfully colourful topping for salads (such as the one below! ), breakfast cereals and desserts. Say ‘goodbye’ to shop-bought salad dressings laden with refined sugars and other artificial additives, and say ‘hello’ to our invigorating homemade goji berry dressing! This wonderfully vibrant salad dressing is made exclusively from wholesome ingredients and adds an interesting splash of colour to all of your favourite salads. 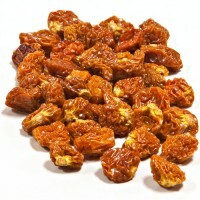 First soak the goji berries in water for around thirty minutes or until soft and moist. Once nice and gooey, pop the goji berries into your blender, along with the olive oil. Next add in the freshly squeezed lemon juice and the raw honey for a subtle touch of sweetness. Blitz for around thirty seconds and hey presto – your goji berry dressing is ready to drizzle generously over your chosen salad. We think it makes the perfect contrast to a simple bed of lettuce and freshly chopped avocado, liberally topped with crunchy walnut halves or pecan nuts. 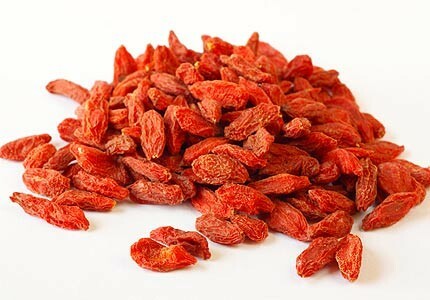 Goji berries are also known as Wolfberries. 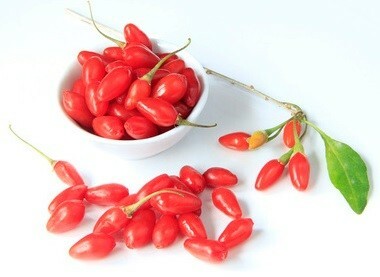 Goji berries are commonly used in traditional Chinese medicine. Goji berries were discovered around 800 AD by local monks who prized their beneficial effects. Goji berries are celebrated in the Chinese province of Ningxia with an annual festival at harvest time. Once open, these goji berries can be eaten within 2 months. To keep the goji berries fresh, always ensure the pack's seal is tightly sealed and store the pack in a dry cool place. Detox Your World was one of the first to provide organic goji berries to the UK. 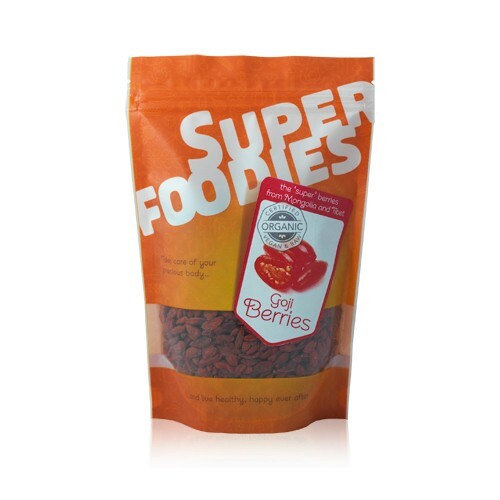 Doing this since 2000, fast forward over 10 years and we are still providing you the best quality goji berries, that we know you love and trust but just now in a brand new Superfoodies bag. 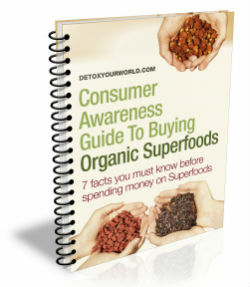 Superfoodies is the exciting new brand from Detox Your World. Superfoodies combines expertise in healthy eating and healthy living, with extensive product development, searching for only the purest and ethically sourced, organic products from nature, such as these wonderful goji berries! Consult your GP before you order goji berries, especially if you are taking blood thinning or high blood pressure medication or if you are being treated for diabetes. Comparing these goji berries to the ones in the health food shop, my 2 and 6 year old say WOW, these are softer and actually taste of something. We have them every second morning as part of our raw breakfast and my kids even ask for the red berry things, lol. They really are lovely and good for you, bonus.